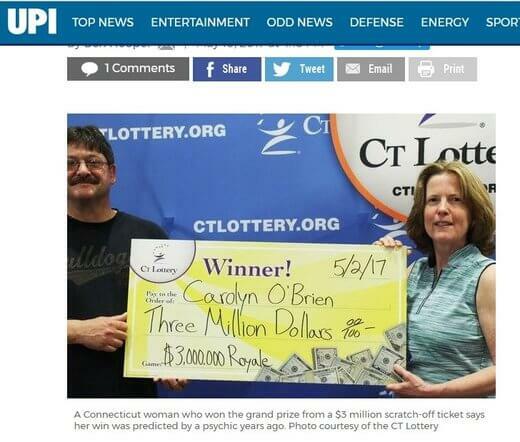 A psychic once told a Connecticut woman that she could see her with a check in her hand saying ” I did it!” It took a few years for that to happen but Carolyn O’Brien of New Milford finally did it! She has just won the top prize of the $3 million Royale instant ticket. Now the O’Brien says a psychic was able to foresee her win. She had scratched the ticket off in the car and then they had to pull over because they were extremely overcome by emotion. She says she started cheering and ended up sobbing in happiness. The lottery says the win is worth $2.3 million if taken as a single lump sum payment.